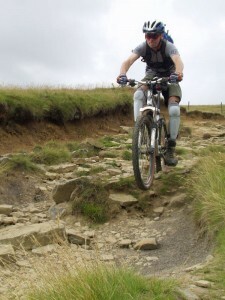 This is a tough mountain bike route of 21.4 miles on the western edge of the Dark Peak. 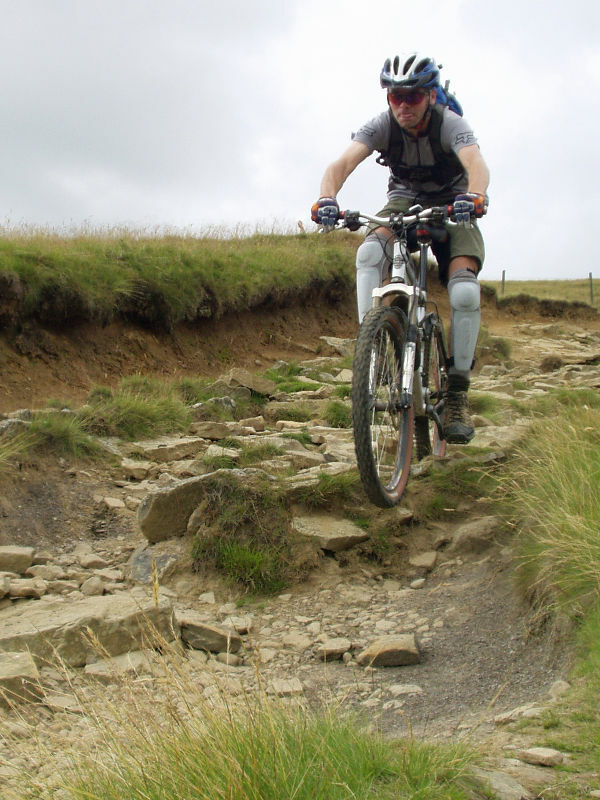 It includes some of the most challenging climbs in the Peak District but there are some fantastic descents as payback, including Jacob's Ladder. 1. The ride starts from the Visitor Centre car park in Hayfield (GR035869). From the car park turn left, away from the centre of Hayfield, and follow the Sett Valley Trail through the trees. After about 1mile follow the track through a tight left then right S-bend to a gate that comes out at a road. After the gate turn right and follow the road over a stone bridge to a steep cobbled track on the right, at the end of the first row of houses (GR020869). 2. Turn right and climb the steep cobbles, which quickly give way to a steep, loose track that climbs between some drystone walls. The track finishes at a gate on a tarmac hairpin. Continue climbing along the left hand lane to the junction at the top, with a row of cottages straight ahead (GR024874). 3. Turn left and climb the lane to a junction with a wide track on the crest, by a small disused quarry on the right (GR020872). Turn right and follow the double track through a farm, then continue straight on past a gated junction on the left. Keep to the line of the wall on the left and after about ½ mile go straight on down the rocky descent to Laneside farm. This is a great descent that starts out steep and rocky, it then bears left to a flat, smooth middle section before a final bouldery descent to a junction with a lane at the bottom (GR014887). 4. Bear slightly left and descend the lane, then go through a right hand bend to pass the water wheel at the Little Mill Inn on the left. Climb a short way from the pub to a junction where the lane bears left (GR011890). Bear right along the track that goes past some houses. It soon reduces in width for a short, tight and bouldery singletrack climb. At the top follow the trail to the left of the low wall and go through a left hand bend, to a lane. Go straight on to the junction in the middle Rowarth (GR012893). 5. Turn right, then at the next junction on the edge of the village bear left and climb the steep lane. The lane soon comes to a gated junction with a track on the right (GR014896). Go through the gate and descend the rocky track to a ford at the bottom. Go through the ford and climb the track to a gate. After the gate bear left and climb the steep lane. Follow the lane to the next junction, with a track on the right signed as the Pennine Bridleway (GR019901). 6. Turn right and follow the wide track. Bear right through the gate on the bend and continue along the track all the way to a junction at a Matley Moor farm (GR024896). Turn left and go past the right hand side of the buildings to a cattle grid at a junction. Go straight across the cattle grid and descend the steep lane through a few bends. Go across a stream at the bottom, then climb to the junction with the A624 (GR033891). 7. Turn left and climb the road to a left hand bend just out of the trees, with a building on the inside. Carefully cross the road and go through the gate on the outside of the bend (GR035894). After the gate go straight on along the double track for a short distance then drop down into Hollingworth Clough on the right. Choose whether to cross the stream by the bridge or the ford. Once over the stream follow the challenging loose, rocky and rutted singletrack climb. The climb goes on for a little under 1mile until the track drops left to another stream crossing. After the steam go up the stone steps. At the top follow the trail to a low wooden bridge that leads to the shooting hut junction (GR049883). 8. Turn left then at the fork immediately after bear right, to follow the edge of the valley. At the next junction a short distance later turn right down the singletrack signposted as a bridleway. As the track descends around to the left it steepens, becoming rutted and rocky. At the triangular junction descend right through the gate in the drystone wall (GR052882). The track widens but and becomes very rocky. 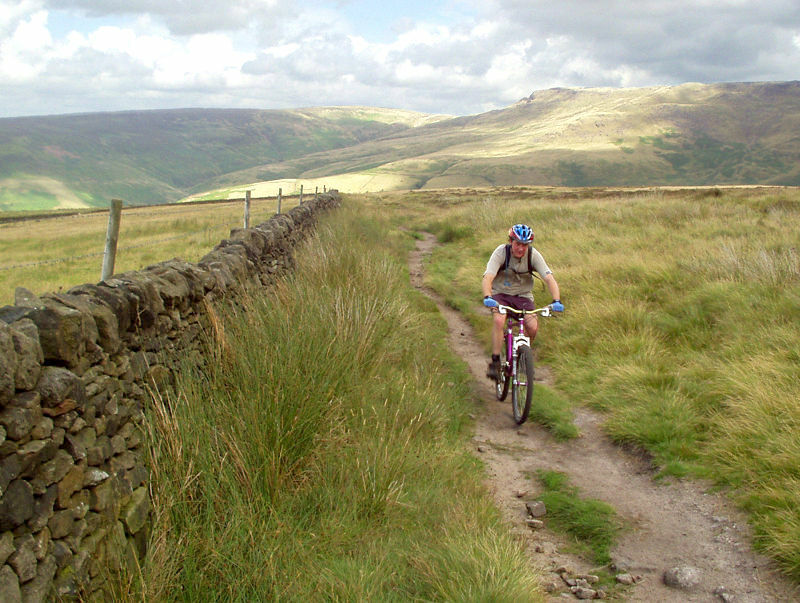 The track finishes at a drystone wall where there is a good view over Kinder Reservoir. Turn right and follow the steep cobbled path down to the gate at the road (GR053880). Watch out for pedestrians, as this is quite a popular path. 9. After the gate follow the road straight ahead to a big green gate. Turn left over the small bridge and climb up the road between the houses. After emerging from the trees the lane comes to a four way junction, with a track on either side (GR054878). Turn right through the gate and climb the rocky track as it snakes its way up the field. When the track levels off it comes to a junction by the woods on the left (GR058877). Turn right and climb the deeply rutted grassy double track through the field. Where the track splits bear left and follow the low broken wall along the contour of the hill. After a while go straight on through the gap in the wall and cross the next field, climbing to the gate in the opposite right hand corner (GR066872). 10. Turn right through the gate and climb the track between the drystone walls. The track opens out and eventually flattens off before bearing right to a gate. After the gate take the track that drops away to the left. The track soon comes to a vague junction just before the obvious track climbs the flank of Kinderlow End. Take the less distinct boggy track to the right. The track soon firms up to become singletrack that gently descends, bearing left around the hill, before coming to a gate in a drystone wall (GR066861). 11. Turn left after the gate and climb the wide rocky track which very soon comes to another gate. Navigation from this point to the top is simply a case of following the main track straight on. It’s a hard climb with plenty of rocks and two steep rock gardens that mark the start of the last third of the climb, which is the most difficult part. While it is possible to clean the whole thing it will have most walking. After reaching the summit at Edale Cross go straight on down a short, rocky descent to the gate at the top of Jacob's Ladder (GR081861). 12. Time to drop your saddle if you need to. At the junction after the gate go straight on to start the descent of Jacob’s Ladder. The trail lets you know what to expect straight away with a rocky drop and loose boulders before it heads down a very steep section of bouldery cobbles. The trail then flattens off a bit and returns to the natural rocks where you can pick up some speed. At the junction halfway down turn hard right to go through a gate. 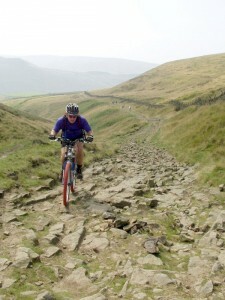 Negotiate the criss-crossing ruts covered in rocks, to a tight left hand bend. After the left hand bend the trail becomes extremely loose and rocky all the way to the gate and stream at the bottom (GR088861). 13. Bear right over the stone bridge and go through the first gate of about three on the wide track that drops into the valley and ends at some farm buildings (GR096855). At the farm go straight ahead on the tarmac. Go through a left/right dip, over a bridge, and up a short climb to a farm at the top. Continue down the lane then bear right and climb to a junction with camp site on the right. Turn left and follow the lane down hill. Go past a car park then under a bridge before the lane finally finishes at a T-junction (GR113847). 14. Turn right and climb the lane to a junction with a gated track on the next left hand corner (GR113843). Turn right through the gate on the outside of the corner to start the Chapel Gate bridleway. Follow the double track to a gate at the bottom of a steep looking climb. Go through the gate and up the climb that scales the left hand side of the valley. After the gate halfway up the track bears left then right before crossing a number of wide rocky water bars. At the top bear left and finish the climb on some small, loose rocks. At the top follow the main track to a triangular junction with a post in the middle (GR099829). 15. Turn right and descend the boulders and rock slabs to a gate. After the gate continue descending the loose boulders and slab steps between the grassy banks. The rocks finish at a gate by the main road on the left. Go through the gate and follow the thin gravel track between the wall and fence to a gated junction a short distance later (GR092825). 16. At the junction turn right and head away from the main road to descend a wide track that starts with a drop. 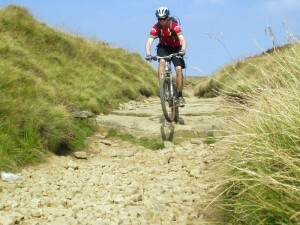 Descend the rocky track to a tight left hand bend in a dip. After climbing out of the dip the trail bears right and flattens off for a while, before descending to another left hand bend in a dip. Again the trail climbs out of the dip, bears right and flattens off. The track then descends through two gates where some speed can be gained. Be careful, after the second gate there are some big rock steps just after a blind left hand bend, which would be easy to hit going too fast. After the rock steps the track bears right and drops into Roych Clough, with some uneven bouldery cobbles just before a stream crossing at the bottom (GR077837). 17. 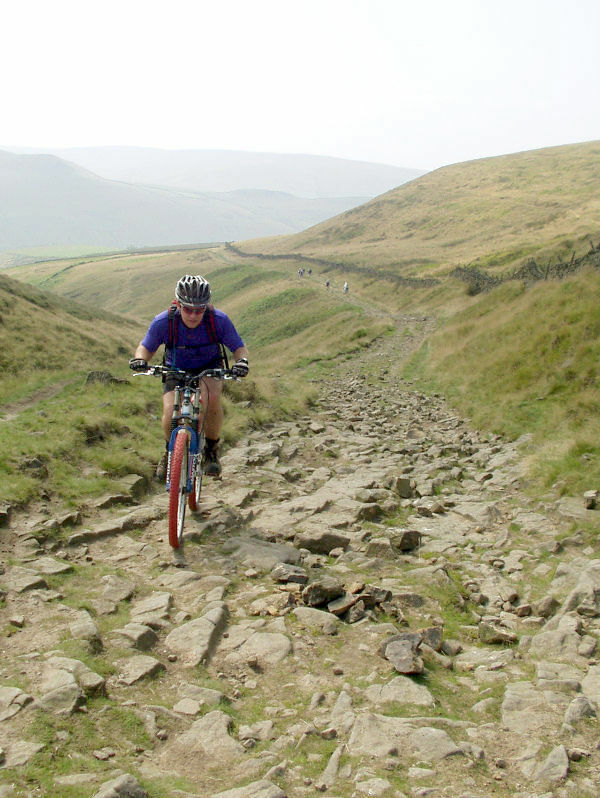 Climb away from Roych Clough following the wide, steep and loose track through a few bends. After a straight section of the climb the track bears right to a junction just after a gate. Go straight on up the track to the next gate. Go through the gate and continue straight on for the final section of the climb, where the trail becomes rutted and rocky. Just before reaching the top at South Head the track bears left over some lumpy bedrock. Go straight over the top and descend a short rock section before traversing the ridge to a gate on the left hand side of Mount Famine (GR056846). 18. Directly after the gate bear right over a bedrock slab then descend the rutted and rocky track that ends at a double gate, making sure not to ride into the drainage ditch just before. At the junction after the gates bear right and descend a wide, straight gravel track. Try not to overshoot the next junction, where the track flattens out slightly and the Pennine Bridleway turns off to the right through a gate (GR050854). 19. Turn right through the gate and follow the thin track between the drystone wall and fence. After the next gate go up a short rutted climb to a gate on the ridge. Once through the gate descend off to the left on the gravel singletrack. This track soon opens out on a rocky double track that goes through a few tight corners and over some water bars. Again be careful, it is all too easy to gain too much speed on this descent. After a tight left hand bend go straight on down the track to a junction. Don't descend to the right, go straight on to a junction with the lane (GR053861). 20. At this junction turn immediately left up the steep gravel track signed posted as the Pennine Bridleway. The track soon flattens and traverses the hillside to a gate in a drystone wall straight ahead at the trees. After the gate go straight on for a rocky and rooty singletrack descent. The track bears left, then right, then left again before flattening off for a fun blast through the trees along the valley. The trail eventually finishes at a gate and a lane by the stream in the bottom of the valley (GR045866). 21. Go straight on along the lane. At the next few junctions go straight ahead, bearing slightly right, until the lane finishes at a junction with the main road going through the centre of Hayfield (GR037868). Turn right and descend past the George Hotel on the left, a good post ride pint option. Continue down the road then turn left directly in front of the church. Go across the A624 using the pedestrian crossing and return to the Visitor Centre car park to complete the ride.